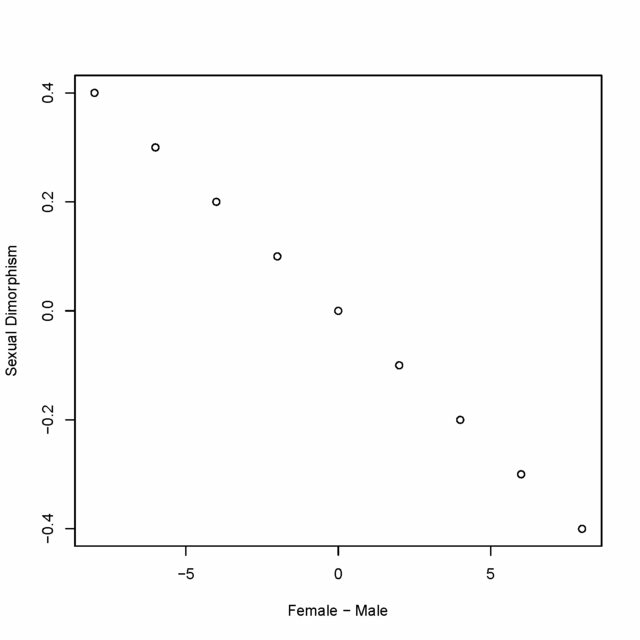 This would give negative values when the female value is smaller than the males, and positive when male is smaller. My issue with this though is that when a female is twice the size of a male its value is -0.5, while when a male is twice the size of a female its value is 1.0, so they do not spread symmetrically around 0. This gives a zero centred value with equal distribution around the mean. For example, when Females are twice the size of males the value is -0.166, and when males are twice the size of females the value is 0.166, when they are the same size it is 0. Browse other questions tagged mathematical-models biostatistics sexual-dimorphism methods or ask your own question. Is bootstrapping an acceptable way to determine standard error for binding constants? Is there a standard reference for the importance of tumor heterogeneity? Is there a gold standard for syphilis?